If you favour the simple and the expedient, you’ll find the premise of RICO appealing. The setting is San Amaro, which is described as ‘a city where any street criminal can become a kingpin and every meth head is an entrepreneur.’ The person doing the describing is Commander Karen Redfern, a woman whose hair – and whose heart – seem made of iron. She has chosen you (a ‘one-of-a-kind rapid response unit’) to stem the tide of a crime wave by ‘any means necessary’ – but mainly the following two, suggested by an early loading screen: ‘Kick doors… shoot men.’ The game can be described, summarised, pitched, praised, and condemned with those four words. RICO’s art style, too, works quickly to grab at your attention. It’s cel shaded, with black lines trapping the colours and tilting toward a comic book aesthetic. Given that the game makes its bed in the murk of B-movies, the look lends it a certain pulpy kitsch. It’s reminiscent of conspiracy thriller XIII, which wore its colours – all the hues of tobacco and toffee – to transport you to the ‘70s, the golden era of paranoia. 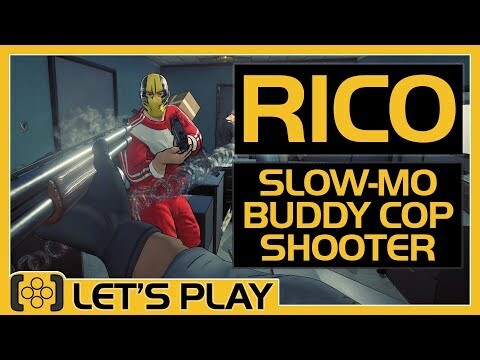 But there’s no such purpose in RICO, and any impression it has on you initially dissolves after a couple of missions. It uses its empty style like wallpaper to cover the cracks in its design.